News just in. I’ll keep it short-ish. This is obviously a faked picture. Noel Fielding and Phill Jupitus were originally holding an Ad for ‘Never Mind The Buzzcocks’ which was due to be aired in the next couple of weeks. I switched the Ad for the ‘Watson ACE’ lads for use on their Facebook page etc. The band feature often on the ‘Ray Foley Show’ on Today FM. 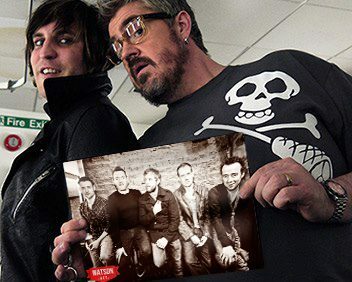 Phil Jupitus was on the show recently and Ray Asked him how he came to know of the boys from Watson ACE. Apparently there was a very awkward silence on air. Phil had no idea what he was talking about. I’ll hold my hands up, my fault. Here is Watson ACE performing a single from their eagerly awaited album Backbone.